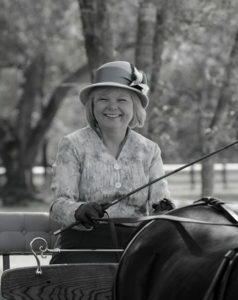 Carriage Gate Morgans is the lifetime dream of Cheryl Gonzalez, Head Trainer. Cheryl has over 30 years of experience in riding, driving and showing a number of quality horses. She has earned the respect of her peers in the horse-world through her dedication to continued learning, and in her ability to pass on her knowledge to others under her direction. Cheryl has continued to pursue her dream of having a business where she could pass on her knowledge, experience and passion for all things horse related. In December 2010, Cheryl with her husband, Omar, bought their own farm in Dade City, FL and her business has moved fully to her new location. Carriage Gate Morgans is home to a number of Morgans with show records including multiple time Champions of FMHA Carriage High Point, FMHA Dressage High Point, FMHA Sport Horse Championship and numerous Combined Driving awards, and Reserve Champion placings. Horses and students in training compete in and out of Florida. We have increased growth in horses in training, as well as in our student program using lesson horses. We strive to maintain a positive environment for all of our students and horses alike. All levels of students and all breeds of horses are welcome at Carriage Gate Morgans. Come see our 10 acre ranch with access to additional acreage/trails for riding and driving. We offer a wide range of amenities to meet all of you and your horse's needs.